We wish to thank everyone that participated in the Fisher House Fundraiser event which raised money for the Fisher House Foundation. Also a huge “Thank You” to creative artist Onzal Boles, for creating a beautifully patriotic-themed quilt. 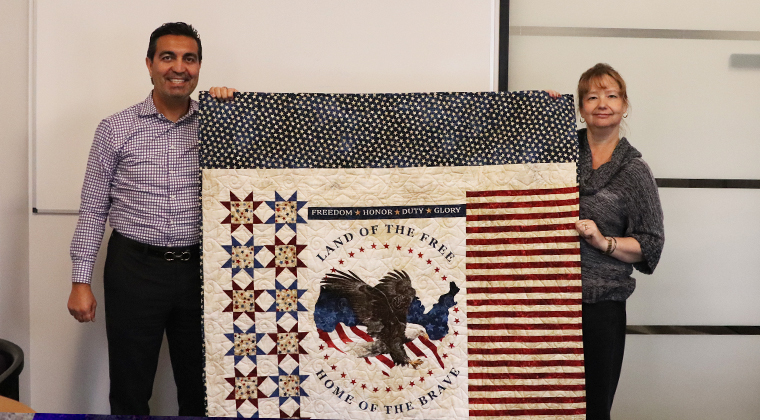 The announcement came on November 19, 2018, that Chief Information Officer, Nader Nemati was the winner of the handmade quilt. 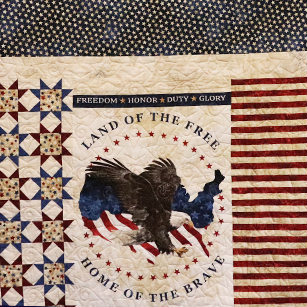 “I am honored to have won such a beautiful and patriotic quilt. I would like to thank Ms. Boles for creating such a meaningful piece in light of our mission at QTC and for such a great fundraiser. I would like to share the beautiful quilt with some of our employees in the other offices for a few months so they can also enjoy this wonderful piece of artwork,” said Nader Nemati. Thank you to all participants for your generous efforts, we were able to raise $1,000 for the Fisher House Foundation, best known for a network of comfort homes where veteran & military families can find housing in during a time of medical need. We will look to display the quilt in several of our offices in the coming months starting with our Philadelphia office. See additional posts about fundraising events by the QTC team here.